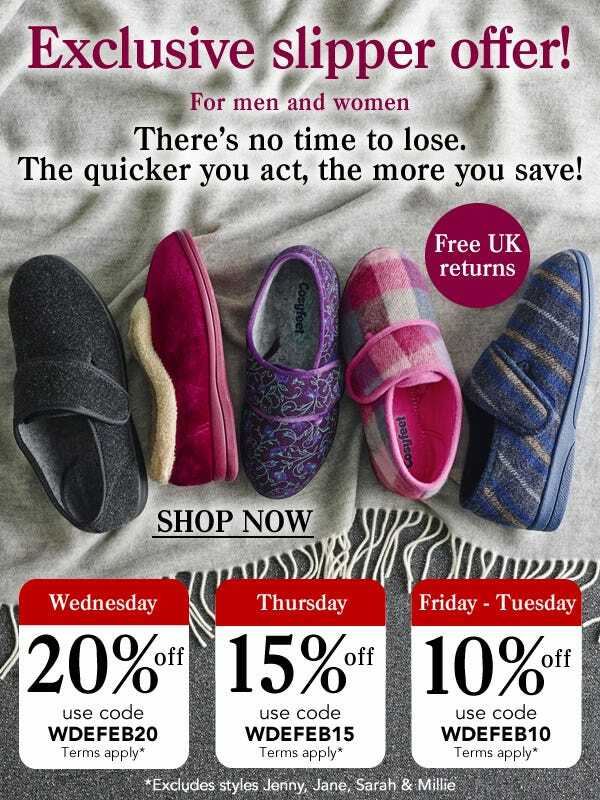 20% off selected slippers: Simply add any pair/s of Cosyfeet slippers (excluding Jenny (F9), Jane (E9), Sarah (B9), Millie (C4)) to your basket and enter the offer code: WDEFEB20 when prompted. 20% will automatically be deducted from your slippers. This offer expires at 11.59pm on Wednesday 10th February 2016. 15% off selected slippers: Simply add any pair/s of Cosyfeet slippers (excluding Jenny (F9), Jane (E9), Sarah (B9), Millie (C4)) to your basket and enter the offer code: WDEFEB15 when prompted. 15% will automatically be deducted from your slippers. This offer expires at 11.59pm on Thursday 11th February 2016. 10% off selected slippers: Simply add any pair/s of Cosyfeet slippers (excluding Jenny (F9), Jane (E9), Sarah (B9), Millie (C4)) to your basket and enter the offer code: WDEFEB10 when prompted. 10% will automatically be deducted from your slippers. This offer expires at 11.59pm on Tuesday 16th February 2016. All offers: Cannot be used in conjunction with any other offer. Offer only applies to in-stock items and the following slippers are excluded from the promotion: Jenny (F9), Jane (E9), Sarah (B9), Millie (C4). We reserve the right to withdraw this offer at any time.